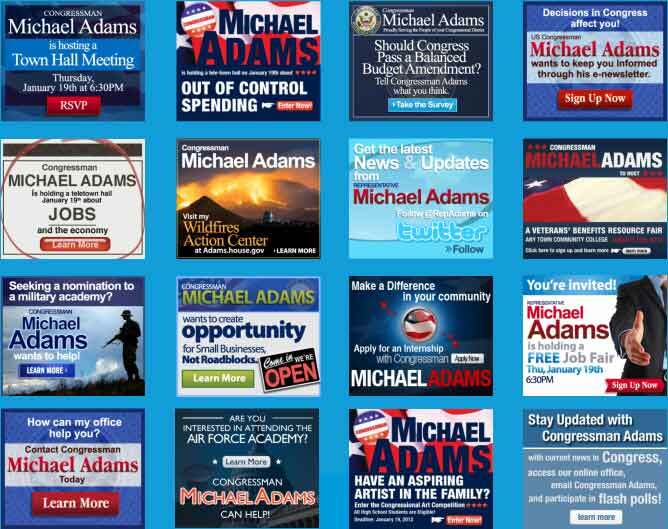 Survey respondents and focus group participants were asked to evaluate “ads” from a fictitious Member of Congress, Michael Adams. The ads were based on those used by actual Representatives. Over the past two years, Members of Congress have increasingly turned to official online advertising to augment their presence on the Internet. Several millions dollars in MRA funds have been spent in an attempt to inform constituents about services that would benefit them, as well as provide new venues for Members to communicate more consistently with residents of their districts. The question is: Is it working? How do we measure effectiveness? Can we? Further complicating the discussion of success is the question of allocating limited resources. Given the significant 2011 and 2012 MRA cuts, offices have to do more with less, so meeting constituents’ expectations about hearing from Members is ever-more-challenging, and requires the use of cutting-edge communications tools. The question this study helps to answer is how best to use them. As with any research study that looks into a topic for the first time, this first-ever, in-depth analysis of official online advertising offers a number of answers to the “low-hanging fruit” questions. But it also raises a number of new questions and leaves other questions unanswered. It is a first look into a topic that merits future study in the years to come. Following the key findings, this report concludes with a list of recommended “Best Practices” to improve the effectiveness of official online advertising by Members of Congress. This is the latest of the Congressional Institute’s study on improving communication between Congress and its constituents. Follow these links for our reports on the effective use of snail mail in the e-mail age, using e-newsletters to reach constituents, harnessing new communications technologies, Congressional Facebook pages, Congressional website and e-newsletter design, Congressional tele-town hall meetings.